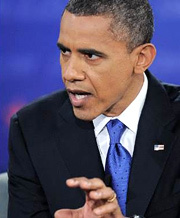 During the debate, Obama performed like the classless lying Chicago bully-in-chief that he is. Every answer out of Obama's mouth was a thinly-veiled personal attack calling Romney a liar, lacking in character, or pronouncing him ignorant. Romney's responses were too classy for my taste. He let Obama get away with far too many attacks. They say the aggressor sets the rules. Since Obama started it, I wanted Romney to deliver multiple factually loaded verbal left hooks to Obama's jaw. Obama touts women rights while implementing policies that hurt women. He talks about putting Americans back to work while demonizing business owners, vowing to punish them with higher taxes and strangling them with thousands of new regulations. Obama has the nerve to pat himself on the back regarding national defense while refusing to call a "terrorist-attack" a "terrorist-attack." Case in point. Families and surviving heroes of the Ft Hood shooting are denied combat benefits because the Obama Administration insists on classifying the shooting as "workplace-violence" rather than what is was, a terrorist-attack. http://nation.foxnews.com/fort-hood-shooting/2012/10/22/obama-denies-benefits-victims-fort-hood-shooters-workplace-violence Why? Because Obama has said the war on terror is over. Thus, classifying the Ft Hood shooting as a terrorist-attack would contradict and embarrass Obama. Consequently, surviving heroes of the shooting and their families, no benefits for you! Disgusting. Obama is nothing more than a jive talking Chicago thug. Polling immediately after the debate declared Obama the winner. I see right through Obama's smooth and compassionate sounding hogwash. I do not care what the polls say. The American people are over Obama's snake-oil salesmanship skills and are donating their "Hope & Change" t-shirts to Good Will, cutting them up for rags or using them as painting shirts. Every policy Obama has implemented over the past four years have created the complete opposite of his stated intentions. Obama says the right things while doing the opposite wrong things in plain sight. The mainstream media supports his every lie and assault on our Constitution and our freedoms. Romney did get in a few strong jabs during the debate. As I stated, I would have loved to have seen a more aggressive Romney confronting Obama's lies and empty rhetoric. However, watching the debate, I asked myself, "Which of these men do I believe most qualified and trustworthy to handle foreign policy and to turn our economy around?"